I thought I was done blogging for the day, but then I received my daily email from the Daily Cross Stitch. For those not familiar with the site, it is a cute little cross stitch site that offers small, inexpressive cross stitch patterns. They also offer one free pattern per day in a daily email. They are usually cutsie little things like animals and baked goods, but today's patterns of restroom signs for men and women were obviously politically motivated. 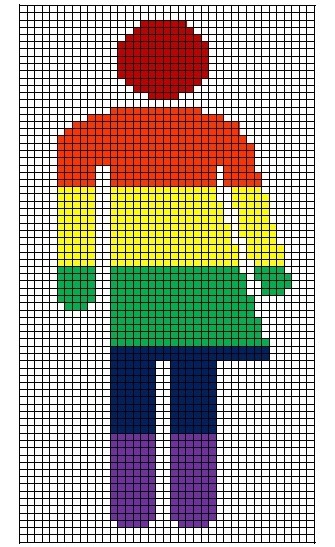 As an alternative to their design, I offer you this free pattern for an inclusive restroom sign. It's part of a much bigger piece that I am working on for the shop and will post in its entirety when completed, but this felt like it needed to be posted as a smaller pattern now. Stitched on 14ct Aida, the finished piece will fit into a standard 5x7" frame and will make any restroom better. You're right--you did need to do this ASAP. Thanks. Their designs are horrifying.